A recent spate of Peruvian press reports allege widespread penetration of domestic social and political groups by Bolivarian Alliance for the Americas (ALBA) member states and affiliated entities. President Garcia’s administration has used the controversy to support its claim that Peru is under attack from an ALBA-directed “conspiracy” and has linked the supposed threat to opposition leader Ollanta Humala as well as to NGOs. Peruvian media outlets in recent weeks have reported on alleged penetration of domestic social and political groups by ALBA members, notably Venezuela. These reports, citing government assessments and legislative commissions, echo the Garcia administration’s insistence that Peru is under attack from an international “conspiracy” headed by Venezuela and Bolivia. 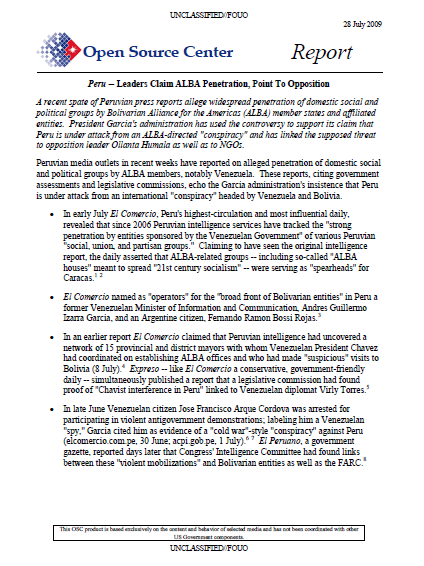 In early July El Comercio, Peru’s highest-circulation and most influential daily, revealed that since 2006 Peruvian intelligence services have tracked the “strong penetration by entities sponsored by the Venezuelan Government” of various Peruvian “social, union, and partisan groups.” Claiming to have seen the original intelligence report, the daily asserted that ALBA-related groups — including so-called “ALBA houses” meant to spread “21st century socialism” — were serving as “spearheads” for Caracas. El Comercio named as “operators” for the “broad front of Bolivarian entities” in Peru a former Venezuelan Minister of Information and Communication, Andres Guillermo Izarra Garcia, and an Argentine citizen, Fernando Ramon Bossi Rojas. In an earlier report El Comercio claimed that Peruvian intelligence had uncovered a network of 15 provincial and district mayors with whom Venezuelan President Chavez had coordinated on establishing ALBA offices and who had made “suspicious” visits to Bolivia (8 July).4 Expreso — like El Comercio a conservative, government-friendly daily — simultaneously published a report that a legislative commission had found proof of “Chavist interference in Peru” linked to Venezuelan diplomat Virly Torres. In late June Venezuelan citizen Jose Francisco Arque Cordova was arrested for participating in violent antigovernment demonstrations; labeling him a Venezuelan “spy,” Garcia cited him as evidence of a “cold war”-style “conspiracy” against Peru (elcomercio.com.pe, 30 June; acpi.gob.pe, 1 July).6 7 El Peruano, a government gazette, reported days later that Congress’ Intelligence Committee had found links between these “violent mobilizations” and Bolivarian entities as well as the FARC.